Oh dear. This one's so bland it's annoying. 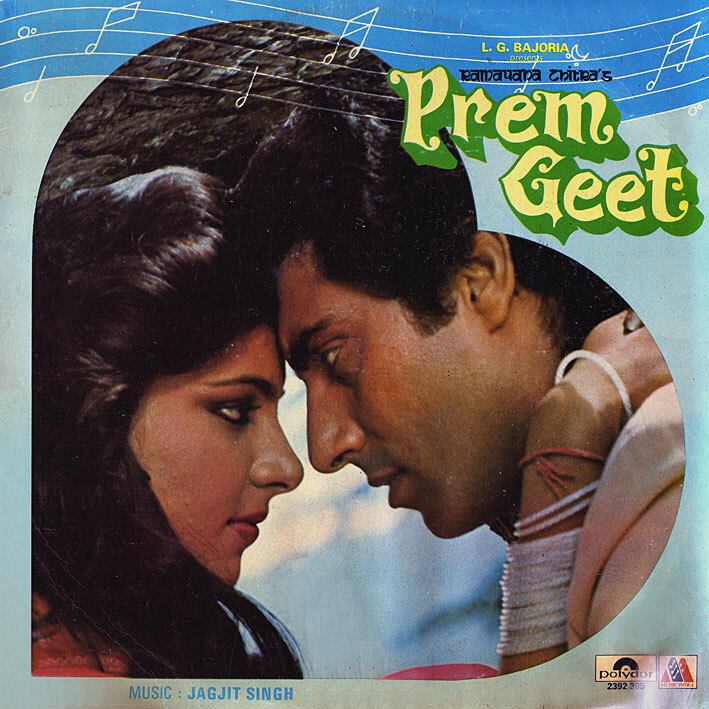 My first inclination was to describe 'Prem Geet' as piss poor, but after another listen (ever the masochist) I've decided I find 'Aao Mil Jayen' just about bordering on mildly tolerable. So perhaps not all that bad then. Not piss poor. Just very, very dull. I love the Honthon Se Chu Lo Tum. In my opinion that is one of the most poetic ghazal I have ever heard. Have to agree with Anonymous above, I know this is not one of your run-of-the-mill funky '70's soundtracks, but that ghazal by Jagjit Singh (Hoton Se Chhu Lo Tum) is simply exquisite. PC, I love your posting all this Bollyood vinyl. Ghazals, poems set to music with a centuries-old heritage, are a big can of worms - Jagjit Singh's popular style (hugely popular alone and with his wife Chitra Singh) is but one of many variants. You might prefer some of the crossover efforts of people like Najma Akhtar and Kiran Ahluwalia - although even that is definitely a different vibe from RD Burman, say. Actually Asha Bhosle did some rather compelling ghazal recordings with Hariharan some years ago, in a commercial light-classical style but a cut above the usual; one divine song Yuhun Na Thi made it to the WOMAD Talking Book Asia comp. Thanks for posting this, even if it isn't really your cup of tea.